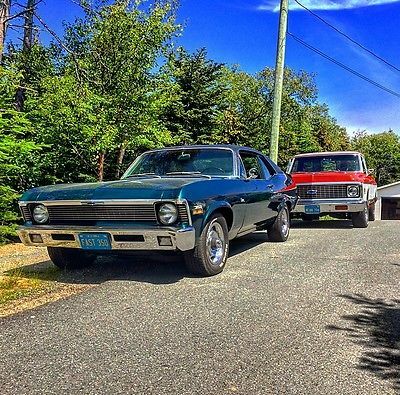 1970 Chevrolet Nova, rust free California car. Custom package which includes: Wood grain door panels, factory A/C, power steering, power disk brakes, antenna in windshield, factory Soft Ray tinted glass, cloth insert seats, clock, stereo, 350 four barrel roughly 330HP, 350 turbo transmission, 10 bolt posi rear end with 3:55 ratio, multi rear leaf springs. Car has seen absolutely no abuse, same owner for the last 14 years. Painted 14 years ago, all wet sanded and buffed. Matching numbers engine was rebuilt 5 years ago at local speed shop for almost $6000, I have all the paper work. Beautiful car, works excellent, no tire kickers, no test pilots. E-Mails only, will not entertain low ballers. ALL ORIGINAL SHEET METAL ZERO RUST. Asking $26,900.00 All recent photos. 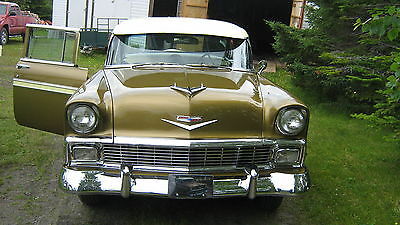 1956 CHEVROLET BELAIR -ARIZONA CAR -ID#VC56K122471 COLOR-GREACIN GOLD AND CLAYPSO CREAM SUN-SHADE CONTINENTIAL KIT I HAVE ORIGINAL MOTOR -NEEDS A LITTLE WORK --HAD HEADS DONE A FEW MONTHS AGO-NOT SURE BUT MAY NEED OIL RINGS. NOT MUCH OF A GUY LISTING ON EBAY BUT I ASSURE YOU I WILL ANSWER ALL EMAILS TO THE BEST OF MY KNOWLEDGE BUYER TO PAY SHIPPING --BUYERS OPTION OF TYPE OF SHIPPING.